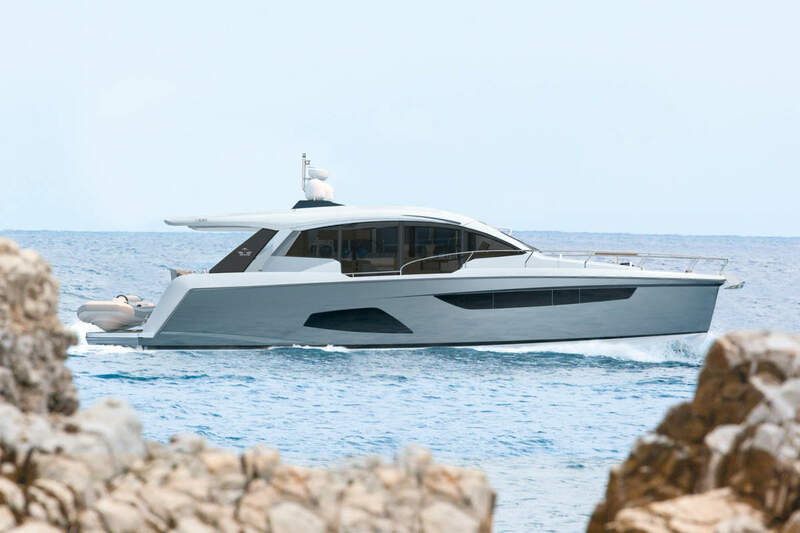 This new model, which is the outcome of the long-standing cooperation between Zuccon International Project and Ferretti Group’s Engineering Department, offers the best an Owner can expect in terms of both seaworthiness and onboard comfort, besides boasting innovative functional and aesthetic solutions that are bound to become key features in the brand’s forthcoming yachts. The Ferretti Yachts 700 immediately strikes the eye for its slender, aggressive profile – one of the sportiest ones ever in the brand’s history. Hull restyling has involved in particular the large hull glazed surfaces – three per side -, which, preserving the family feeling with those found on the new 55-footer, are stanchion-free and with flush glued portholes, providing a wide unobstructed view. The superstructure conveys a sense of sophisticated lightness: the dark long deck glazing, in the same color as the stanchions, ‘cuts’ across the yacht’s profile from stern to bow. The glazing follows the lowering of the gunwale in the central part of the boat, where the living room can be found, thereby reflecting on the outside the main deck interior layout, while increasing the general sense of lightness that pervades the entire craft. The lowering in the glazing also lets in plenty of natural light and offers guests and the crew alike the widest possible view on the surrounding landscape. The Ferretti Yachts 700’s aerodynamic design is most apparent in the elongated tail, surmounted by a roll bar housing satellite systems and antennas and characterized by a new color shade, called ‘Vulcan Grey’. Starting from the Ferretti Yachts 700, this warm grey shade will become the brand’s second color, and will be used on all accessory systems (roll bars, hard tops…), in contrast with the white shade of the hull and the superstructure. The installation of all antennas in the roll bar will also make it possible to free up the aft area of the flybridge of any and all technical elements, thereby offering the Owner a panoramic terrace that can be furnished with free standing furniture. The aft area of the yacht is characterized by several important innovations, above all a carry-over from all the latest Ferretti Yachts models that will be undoubtedly very much appreciated including the swimming platform (featuring a teak floor on the first hull) with integrated tender lift that can be diagonally lowered by approximately one meter below the sea level. This system results in a large underwater bathing area and allows guests to easily go into and come up from the water, also thanks to a series of steps integrated in the hull that are revealed when the platform is submersed. This also eliminates any need for a davit for tender launching and hauling operations (the system can handle a tender up to 3.85 meters long). To the right of the staircase leading to the cockpit two large peaks have been obtained, the first at the swimming platform level, the second behind the aft sofa. The large cockpit, which can also be accessed via a concealing gangway to port, is fitted with a long sofa, facing the fixed teak table that can seat up to eight people. A steel framed sliding glazed door, beside the staircase leading to the flybridge, allows access to the interiors, while to starboard the stairs lead to the crew quarters, consisting of a single cabin (which can also be fitted with bunk beds upon request), a separate head, and a laundry area along the starboard bulwark. Stepping in through the glazed door, access is gained to a breathtakingly wide and rationally arranged salon – an open space with all sides open onto the sea. The eye can sweep freely from the stern to the extreme bow, through the living room, the dining room, and the pilot station, which unravel in an orderly, uninterrupted succession. This area conveys an incredible sense of conviviality, which can be increased even further by opening the glazed door and extending the open space all the way through the cockpit. Guests are welcomed by a living area furnished with a C-shaped sofa and a chaise longue with a movable stool and a coffee table on the left, opposite which are a second sofa along the bulwark and, behind it, the cabinet for the 40″ TV screen, which can be concealing upon request. The dining area includes a large galley – open in the central part of the deck to starboard – and can boast furniture and furnishings that can be normally found on larger yachts, as well as storage cabinets and cupboards for utensils and glassware. The C-shaped worktop extends from the left bulwark crosswise behind the sofa and then toward the dining table, thanks to a functional peninsula where cocktails and dishes can be prepared. The worktop is built in the innovative, environmentally-friendly, leather-shade material called ‘Paperstone’, pleasing to the eye and to the touch. On the starboard side stands the glass-top table, surrounded by an L-shaped sofa. The pilot station is located to starboard at the extreme bow and is directly connected to the outside by a door opening onto the walkway. A co-pilot seat can be installed beside the pilot one, allowing to share the thrill of cruising with the captain. Part of the pilot station has been left open toward the stairwell, thereby increasing the sense of airiness that pervades this entire area and preventing any volumetric barriers, so that the eye can sweep from the pilot station, below deck, all the way to the corridor leading to the cabins. The guest area layout bears witness to the Ferretti Yachts 700’s great versatility. The two layouts mainly differ in the design of the lobby and the guest cabins, while the master stateroom and the VIP suite, at the bow, remain unchanged. Every cabin can benefit from plenty of natural light, thanks to the stanchion-free windows with flush portholes – 2 per cabin. All cabins also share the same type of décor, always reflecting the greatest possible care for details. The bathrooms’ style has been harmonized too. The full-beam master stateroom, located amidships, is vary spacious and rationally arranged. The two windows are surrounded by frames that enhance the sinuous, rounded shape of the glazing. The large Owner’s bathroom, with a large separate shower box, and the walk-in wardrobe are located behind the bed – a solution that further increases the distance between the master quarters and the engine room, which are now separated by both the sailor’s cabin and the tank, minimizing noise. The cabin furniture is completed by a vanity set and a stool to starboard and, on the opposite side, a sofa and two chests of drawers. The TV cabinet is large enough to host a screen up to 40” wide. The VIP cabin is located at the extreme bow. It features a double bed and a private bathroom with separate shower, which is accessed from the central corridor. In the four-cabin version, two steps lead down to the master quarters, while two side doors give access to the large guest cabins, both with twin beds and private bathroom with separate shower. Upon request, the right guest cabin can be fitted with a double bed. In the three-cabin layout, the guest cabin is furnished with a double bed that, upon request, can be converted into two separate single beds. This cabin can rely on a bathroom with separate shower. In this latter version, the lobby is located along the port bulwark and is lit by the hull glazing with two flush portholes. The flybridge, protected by a roll bar where the Bimini top can be installed, is the result of a painstaking design process aimed at ensuring maximum relaxation in all outdoor areas. This is why this new 70-footer also features a large forward sunbathing area on the deckhouse, where guests can relax enjoying the utmost privacy. To the right of the flybridge staircase is a bar unit, beside which is the dinette, featuring a large C-shaped sofa and a table. The second pilot station can be found on the starboard side. Furnished with a large seat, it allows more than one guest to share the experience of piloting. A small sofa facing the sea stands beside the forward sunbathing area, on the port side. The flybridge can be used and enjoyed entirely, all the way to the stern, as the installation of antennas and satellites systems on the roll bar, together with a pulpit in the aft part, has allowed freeing up the entire area, that can be furnished with freestanding furniture. This is a very flexible relaxation area, with teak flooring on the first hull, which the Owner can also decide to use for additional storage purposes. An alternative version of the flybridge is also available, featuring an aerodynamic hard top with an electrically operated awning that covers most of the forward and aft parts. Two MAN engines are installed in the engine room – one single space that, besides the engines, hosts all systems and wheel controls. Ferretti Yachts proposes two V8 1000 Mhp engines, allowing to reach a maximum speed of 28.5 knots and a cruising speed of 25 knots. As an alternative, the yacht can be equipped with two more powerful, 1200 Mhp, MAN V8 that will push it to a top speed of 31.5 knots and a cruising speed of 28 knots. Ferretti have continued to deliver excellence in 700, with many features shared amongst the range, it’s a hard choice for customers to pick from.